A year ago, I first identified scholarship issues in the 2006 Wegman report, the contrarian touchstone commissioned by Republican congressman Joe Barton as part of his concerted campaign to discredit the “hockey stick” temperature reconstruction and the scientists behind it, especially Michael Mann. (The report was produced by lead author George Mason University statistics professor Edward Wegman, along with co-authors Rice University professor David Scott and Wegman protégé Yasmin Said, although Scott seems to have had little to do with it). Eventually, I demonstrated apparent plagiarism in 10 pages of background sections in the report, as well as in an obscure (but federally funded) follow-up article by Said, Wegman and two other Wegman acolytes. At the time, it seemed a matter of interest only in the blogosphere, while the mainstream media ignored the issue in favour of the bogus “climategate” scandal. But it turned out that my work had come to the attention of at least one important player in this drama – paleoclimatologist and “hockey stick” co-author Raymond Bradley. Back in March, Bradley quietly filed an initial complaint with GMU alleging plagiarism by Wegman et al of Bradley’s own work, attaching some of my initial analysis. Two months later, Bradley updated GMU with my further evidence of more “widespread” plagiarism, including wholesale copying of passages from two social network text books and Wikipedia, in both the Wegman report itself, and the follow-up 2008 article by Said et al. Bradley also took special care to point out the discovery of federal funding for the latter, which made the apparent breaches of misconduct policy all the more serious. None of this was known until the ever patient Bradley went public, notably in recent statements in online and print articles by USA Today science reporter Dan Vergano. Now, a comprehensive report by John Mashey, based on the complete communication between Bradley and GMU research vice president Roger Stough, along with an analysis of GMU’s academic misconduct policy, shows exactly why Bradley finally came forward. Strange Investigations at George Mason University [PDF 2.6 Mb ], presents a shocking picture of foot-dragging and lack of transparency at GMU. Despite the copious evidence presented by Bradley, no substantive action ensued until the belated August convening of the inquiry committee. That committee was supposed to have reported within 60 days of its ostensible nomination in April, and had only to consider the limited question of whether the allegations were substantive enough to warrant a full-blown investigation. Yet even the committee’s belated start only came after the intervention of Elsevier environmental sciences publisher John Fedor. Even worse, GMU’s Stough failed to provide promised progress reports, and the inquiry committee missed Stough’s stated September 30 deadline for delivery of its report. And Stough’s last substantive response in October to Bradley vaguely referred to needing “a few weeks more” to wrap up the inquiry phase, while since then he has stonewalled all further requests for updates. So more than nine long months after Bradley’s initial complaint, GMU has yet to clearly reach the end of its initial inquiry, a phase that should have been pursued rigorously and resolved easily within GMU’s own timelines. That is especially so given the compelling evidence and the impetus of the serious issue of federal funding, which normally requires resolution of a misconduct inquiry within 60 days as a matter of law. All of this calls into serious question GMU’s misconduct policy and process, and indeed the university’s very commitment to fundamental principles of academic integrity. Today I continue my examination of the key analysis section of the Wegman report on the Mann et al “hockey stick” temperature reconstruction, which uncritically rehashed Steve McIntyre and Ross McKitrick’s purported demonstration of the extreme biasing effect of Mann et al’s “short-centered” principal component analysis. First, I’ll fill in some much needed context as an antidote to McIntyre and McKitrick’s misleading focus on Mann et al’s use of principal components analysis (PCA) in data preprocessing of tree-ring proxy networks. Their problematic analysis was compounded by Wegman et al’s refusal to even consider all subsequent peer reviewed commentary – commentary that clearly demonstrated that correction of Mann et al’s “short-centered” PCA had minimal impact on the overall reconstruction. Next, I’ll look at Wegman et al’s “reproduction” of McIntyre and McKitrick’s simulation of Mann et al’s PCA methodology, published in the pair’s 2005 Geophysical Research Letters article, Hockey sticks, principal components, and spurious significance). It turns out that the sample leading principal components (PC1s) shown in two key Wegman et al figures were in fact rendered directly from McIntyre and McKitrick’s original archive of simulated “hockey stick” PC1s. Even worse, though, is the astonishing fact that this special collection of “hockey sticks” is not even a random sample of the 10,000 pseudo-proxy PC1s originally produced in the GRL study. Rather it expressly contains the very top 100 – one percent – having the most pronounced upward blade. Thus, McIntyre and McKitrick’s original Fig 1-1, mechanically reproduced by Wegman et al, shows a carefully selected “sample” from the top 1% of simulated “hockey sticks”. 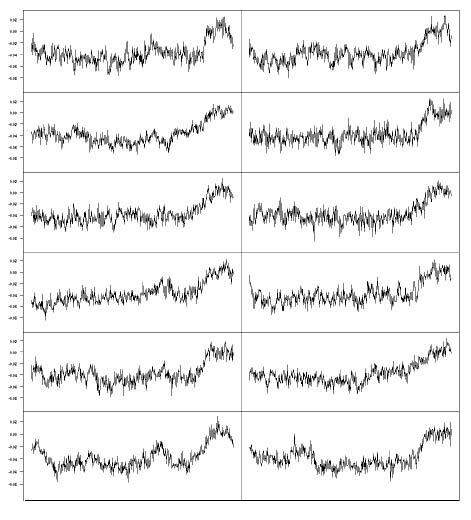 And Wegman’s Fig 4-4, which falsely claimed to show “hockey sticks” mined from low-order, low-autocorrelation “red noise”, contains another 12 from that same 1%! Finally, I’ll return to the central claim of Wegman et al – that McIntyre and McKitrick had shown that Michael Mann’s “short-centred” principal component analysis would mine “hockey sticks”, even from low-order, low-correlation “red noise” proxies . But both the source code and the hard-wired “hockey stick” figures clearly confirm what physicist David Ritson pointed out more than four years ago, namely that McIntyre and McKitrick’s “compelling” result was in fact based on a highly questionable procedure that generated null proxies with very high auto-correlation and persistence. All these facts are clear from even a cursory examination of McIntyre’s source code, demonstrating once and for all the incompetence and lack of due diligence exhibited by the Wegman report authors. The recent focus on George Mason University’s investigation into plagiarism allegations concerning the Wegman “hockey stick” report and related scholarship has led to some interesting reactions in the blogosphere. Apparently, this involves trifling attribution problems for one or two paragraphs, even though the allegations now touch on no less than 35 pages of the Wegman report, as well as the federally funded Said et al 2008. Not to mention that subsequent editing has also led to numerous errors and even distortions. But we are also told that none of this “matters”, because the allegations and incompetence do not directly touch on the analysis nor the findings of the Wegman report. So, given David Ritson’s timely intervention and his renewed complaints about Edward Wegman’s lack of transparency, perhaps it is time to re-examine Wegman report section 4, entitled “Reconstructions and Exploration Principal Component Methodologies”. For Ritson’s critique of the central Wegman analysis itself remains as pertinent today as four years ago, when he expressed his concerns directly to the authors less than three weeks after the release of the Wegman report. Ritson pointed out a major error in Wegman et al’s exposition of the supposed tendency of “short-centred” principal component analysis to exclusively “pick out” hockey sticks from random pseudo-proxies. Wegman et al claimed that Steve McIntyre and Ross McKitrick had used a simple auto-regressive model to generate the random pseudo-proxies, which is the same procedure used by paleoclimatologists to benchmark reconstructions. But, in fact, McIntyre and McKitrick clearly used a very different – and highly questionable – noise model, based on a “persistent” auto-correlation function derived from the original set of proxies. As a result of this gross misunderstanding, to put it charitably, the Wegman report failed utterly to analyze the actual scientific and statistical issues. And to this day, no one – not Wegman, nor any of his defenders – has addressed or even mentioned this obvious and fatal flaw at the heart of the Wegman report. David Ritson, emeritus professor of physics at Stanford University, has updated Steve McIntyre and the rest of the world on a key controversy concerning the Wegman Report, namely Edward Wegman’s ongoing failure to release supporting material related to the analysis within the Wegman report, more than four years after his promises to do so. Here is Ritson’s complete comment, addressed to McIntyre at ClimateAudit. This report offers a detailed study of the “Wegman Report”: Edward J. Wegman, David W. Scott, Yasmin H. Said, “AD HOC COMMITTEE REPORT ON THE ‘HOCKEY STICK’ GLOBAL CLIMATE RECONSTRUCTION”(2006). It has been key prop of climate anti-science ever since. It was promoted to Congress by Representatives Joe Barton and Ed Whitfield as “independent, impartial, expert” work by a team of “eminent statisticians.” It was none of those. A Barton staffer provided much of the source material to the Wegman team. The report itself contains numerous cases of obvious bias, as do process, testimony and follow-on actions. Of 91 pages, 35 are mostly plagiarized text, but often injected with errors, bias and changes of meaning. Its Bibliography is mostly padding, 50% of the references uncited in the text. Many references are irrelevant or dubious. The team relied heavily on a long-obsolete sketch and very likely on various uncredited sources. Much of the work was done by Said (then less than 1 year post-PhD) and by students several years pre-PhD. The (distinguished) 2nd author Scott wrote only a 3-page standard mathematical Appendix. Some commenters were surprised to be later named as serious “reviewers.” Comments were often ignored anyway. People were misused. The Wegman Report claimed two missions: #1 evaluate statistical issues of the “hockey stick” temperature graph, and #2 assess potential peer review issues in climate science. For #1, the team might have been able to do a peer-review-grade statistical analysis, but in 91 pages managed not to do so. For #2, a credible assessment needed a senior, multidisciplinary panel, not a statistics professor and his students, demonstrably unfamiliar with the science and as a team, unqualified for that task. Instead, they made an odd excursion into “social network analysis,” a discipline in which they lacked experience, but used poorly to make baseless claims of potential wrongdoing. In retrospect, the real missions were: #1 claim the “hockey stick” broken and #2 discredit climate science as a whole. All this was a facade for a PR campaign well-honed by Washington, DC “think tanks” and allies, underway for years. Most people can just read the 25-page main discussion, but 200+ pages of backup text are included to provide the necessary documentation, as some issues are potentially quite serious. For a quick download, read the Executive Summary (first six pages). Then, here is the complete report, including the main discussion and 200+ pages of appendices. Several posts in past months have highlighted highly questionable scholarship in the 2006 Wegman report on the “hockey stick” temperature reconstruction (and revelations of much more will come soon, with the imminent release of John Mashey’s massive analysis). Today I present yet another analysis of background material of “striking similarity” to antecedents, this time found in a trio of dissertations by recent George Mason University PhD students under the supervision of Edward Wegman. Wegman Report co-author Yasmin Said’s 2005 dissertation on the “ecology” of alcohol consumption appears to presage some of the questionable scholarship techniques employed in the Wegman Report. And later dissertations from two other Wegman proteges, Walid Sharabati (2008) and Hadi Rezazad (2009), both have extensive passages that follow closely Wegman Report’s social networks background section, which in turn is based on unattributed material from Wikipedia and two widely used text books. Thus, as in the case of Donald Rapp, there appears to be serial propagation of unattributed, “striking similar” material. Astonishingly, all three Wegman acolytes were honored with an annual GMU award for outstanding dissertations in statistics and computational science. However, a closer look betrays not only scholarship problems in the work, but clear failure in the PhD supervision process itself. It may also be that some heat is being felt behind the scenes. For one thing, Said’s 2005 dissertation was recently deleted from the George Mason University website. And around the same time, most traces of Said’s eye-opening presentation on the Wegman panel process [PDF] were also deliberately removed. That appears to be a clumsy attempt to cover up embarrassing details about the U.S. House Energy and Commerce Committee 2005-2006 climate investigation, including the key role of Republican staffer Peter Spencer, Representative “Smoky” Joe Barton’s long time point man on climate change issues. (These disappearances were pointed out to me by the ever-vigilant John Mashey). This is the final instalment in a series of posts documenting dubious scholarship and unattributed sources in the background chapter of the touchstone of climate contrarians known as the Wegman Report. That report has been touted as Exhibit A proving the “destruction” of Michael Mann’s “hockey stick” graph by self-styled climate auditor Steve McIntyre. Previously, I found extensive passages bearing “striking similarity” to a classic text by the distinguished paleoclimatologist (and “hockey stick” co-author) Raymond Bradley in the background sections on tree rings and on ice cores. Subsequently, the background section on social networks was found to contain material apparently drawn without attribution from a variety of sources, including Wikipedia and several text books. This time, I’m looking at section 2.2 (see Wegman Report PDF at p. 15), which gives the background of key statistical concepts, including Principal Component Analysis. Astonishingly, even this section appears to contain a significant amount of unattributed material from other sources, although quite a bit less than the other sections. Again, Wikipedia appears to be a key source, along with a couple of text books. I’ll also introduce some refinements to the text analysis, based largely on John Mashey’s recent innovations. Those refinements allow a better characterization of the relationship between various passages in Wegman et al and their apparent antecedents, as well as permitting a quantitative analysis based on word counts.